When I’m not commenting on nonfiction books, films, and documentaries, I run an online marketing company called Click Here Online Marketing. I offer the following services: web design and development, PPC advertising, search engine optimization, social media marketing, and my latest offering – mobile marketing. 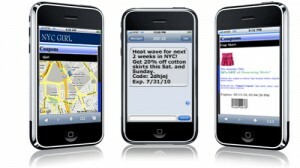 Mobile marketing is the hottest trend in advertising right now. There are numerous ways for a business or organization to engage with their customers via mobile phones. And because we all have all our phones with us most of the time, you’re sure to reach your target audience. Now you have to have a valid reason for contacting your customer on their mobile phone. You can’t just send them a text message every day saying “please buy from us.” You have to offer something of value – a coupon, discount, or other special offer. If you don’t, the customer will opt out of your mobile marketing list just as fast as they can send a text message. This is s brand new service for me and like any good online marketing consultant, I sent out a press release announcing this service. You can read the press release here St. Louis Firm Adds Mobile Marketing Services. In addition to a wide range of mobile marketing services, I now offer mobile website development. You can see an example of a mobile website by viewing this site in your mobile browser. Got an iPad. This site looks downright awesome on an iPad. Just open up your mobile browser and navigate to EverythingNonfiction.com. For more information about this new service or any of my other services, please visit ClickHereOnlineMarketing.com.